Juneteenth is the oldest known celebration commemorating the ending of slavery in the United States. On June 19, 1865, Union soldiers, led by Major General Gordon Granger, landed in Galveston, Texas with news that the war had ended and the enslaved were now free. Juneteenth is recognized as a state holiday or special day of observance in most states, including Utah. "Let us discard all this quibbling about this man and the other man, this race and that race and the other race being inferior, and therefore they must be placed in an inferior position. Let us discard all these things, and unite as one people throughout this land, until we shall once more stand up declaring that all men are created equal." This bill provides that Juneteenth Freedom Day shall be commemorated annually in Utah on the third Saturday in June, in honor of Union General Gordon Granger proclaiming the freedom of all slaves on June 19, 1965 in Galveston, Texas. Wikipedia, the free Encyclopedia provides the history of the Juneteenth holiday. Juneteenth is the oldest known celebration commemorating the ending of slavery in the United States. 2015 was the 150th Anniversary Celebration. 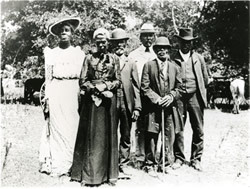 Archives and references on Juneteenth and African-American Rights in Texas. Includes the history of Juneteenth, and links to other educational sources, such as the text of the Emancipation Proclamation, events of the Civil Rights Movement, slavery in Texas. "To bring all Americans together to celebrate our common bond of freedom through the recognition, observance, education and historic preservation of Juneteenth in America." "Together we will see Juneteenth Independence Day become a National Holiday Observance in America!" The name Juneteenth is a combination of the words June and nineteenth. ReadWriteThink Reading and writing activities to learn more about Juneteenth. Invite your students to compare Juneteenth celebrations to Fourth of July celebrations, using the Venn Diagram. When visiting the recommended website in this lesson, students learn about the Underground Railroad and "walk in the shoes" of an escaping slave. Free Juneteenth Printables for elementary students. Juneteenth history, spelling, and word-related worksheets. To celebrate Juneteenth, families frequently have barbecues, races, go fishing, and play games. Uses historical maps, documents and videos to celebrate the 150th year of the annual Juneteenth historic celebration since its creation on June 19, 1865. On December 18, 1865, the Thirteenth Amendment was adopted as part of the United States Constitution. The amendment officially abolished slavery, and immediately freed more than 100,000 slaves, from Kentucky to Delaware. These lesson plans and curricular materials contain video segments from The African Americans: Many Rivers to Cross with Henry Louis Gates, Jr., instructions for classroom implementation, student handouts, links to online resources, and suggestions for extension activities. View timeline and documents of the Emancipation Proclamation at the Library of Congress site. Branch, Muriel Miller Juneteenth: Freedom Day, Cobblehill, 1998. The author discusses and provides pictures of her own discoveries and experiences in researching the holiday. Cooper, Floyd Juneteenth for Mazie. Capstone, 2015. Little Mazie wants the freedom to stay up late, but her father explains what freedom really means in the story of Juneteenth, and how her ancestors celebrated their true freedom. Leeper, Angela Juneteenth: A Day To Celebrate Freedom from Slavery. Enslow, 2004. Covers the origin and history of the holiday and describes how it is celebrated today. Otfinoski, Steven The Story of Juneteenth: An Interactive History Adventure, Capstone, 2015. The Emancipation Proclamation and the Civil War have brought an official end to slavery, yet some Southern slave owners are refusing to comply. The road to freedom is still long and hard for many African-Americans, but you are not giving up. Will you, overcome obstacles to begin a new life of freedom, seek out your family, or fight back? When YOU CHOOSE, history gets real. Weatherford, Carole B. Juneteenth Janboree, Lee & Low Books, 1995. Cassandra and her family have moved to her parents’ hometown in Texas, but it doesn’t feel like home to Cassandra until she experiences Juneteenth. Wesley, Valerie Wilson Freedom’s Gifts: A Juneteenth Story, Simon & Schuster, 1997. With the help of their elderly aunt, June and her cousin celebrate Juneteenth. Ellison, Ralph Juneteenth: a novel. Random House, 1999. Shot on the Senate floor by a young Black man, a dying racist senator summons an elderly Black Baptist minister from Oklahoma to his side for a remarkable dialogue that reveals the deeply buried secrets of their shared past and the tragedy that reunites them. Rinaldi, Ann Come Juneteenth, HMH Books, 2009. Fourteen-year-old Luli and her family face tragedy after failing to tell their slaves that President Lincoln’s Emancipation Proclamation made them free. Kimble-Ellis, Sonya Traditional African American Arts and Activities, Jossey-Bass, 2001. African Americans throughout our country’s history have developed a rich heritage of arts and activities. Discover and enjoy many of these traditions, from celebrating Juneteenth to making African masks to creating unique quilts. Narrated book about little Mazie who wants the freedom to stay up late, but her father explains what freedom really means in the story of Juneteenth, and how her ancestors celebrated their true freedom. Television documentary produced for the Texas Institute for the Preservation of History and Culture exploring the beginning of this unique holiday and its significance today. "The Age of Slavery" illustrates how black lives changed dramatically in the aftermath of the American Revolution. Today “Lift Every Voice and Sing” is one of the most cherished songs of the African American Civil Rights Movement and is often referred to as the Black National Anthem. Use this educator guide to engage students in Grades 6-10 with The Underground Railroad: Journey to Freedom interactive learning the perspective of a slave who longs for freedom. Use the interactive timeline to navigate a history of slavery in the United States. Explore the ways that slavery has been woven into the fabric of societies in America and around the world. Places to go (some real and some virtual) to find out about slavery in America. America's journey through slavery is presented in four parts. For each era, you'll find a historical Narrative, a Resource Bank of images, documents, stories, biographies, and commentaries, and a Teacher's Guide. From art to technology, there are activities to connect Black history with every subject including holiday resources for Kwanzaa and Martin Luther King Jr Day. Educating young people about the constitution.